JACKSON, Miss. (AP) — At first, it was a rap star on a spring break shopping jaunt on a Mississippi Sunday afternoon. Then, cellphone video shows a security guard pepper spraying rapper Boosie Badazz and his entourage after he told them to leave the Polo Ralph Lauren section of a department store. Finally, police say it was five people attacking the security guard and a Biloxi police officer outside the department store moments later. Biloxi Police Lt. Christopher De Back said three men face felony assault charges, while two juveniles were also arrested after the mall melee, sparked by what officers said was a disorderly crowd following the rapper. 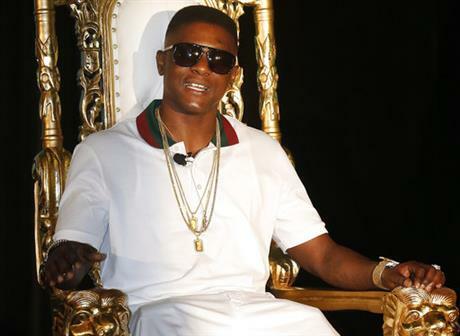 Formerly known as Lil Boosie, he had performed in Biloxi Saturday night. The Mississippi Gulf Coast was crowded with what police said were as many as 60,000 tourists attending Black Beach Weekend, an annual magnet for young African-Americans from throughout the South. Edgewater Mall, where the incident took place, is a focus for crowds. De Back said the guard pepper sprayed at least one person as he sought to eject a crowd from a Dillard’s department store. De Back said he didn’t know if the Louisiana rapper, born Torence Hatch, was sprayed, but cellphone videos posted by local media show Boosie within a few feet of the officer when he sprays the chemical agent. After the crowd exited the store, De Back said people “who appeared to be with Lil Boosie” attacked the security guard and a Biloxi police officer who waded in, knocking both to the ground and kicking and punching them. Boosie was present during the assault, but didn’t participate, De Back said. Police said the assailants left in a van and were arrested a short time later about 4 miles away in Biloxi. Charged with felony assault are 19-year-old Ivy Givens of Baton Rouge, Louisiana; 32-year-old Sedale Coleman of Tucker, Georgia; and 26-year-old Patrick Tolbert of Mobile, Alabama. Givens and Coleman were released from the Harrison County jail Monday after posting $50,000 bail. Tolbert remains jailed unless he posts bail. Police also arrested the van’s driver, 33-year-old Ollie Harper of Atlanta, on charges of possessing a stolen gun. Harper also remains jailed pending $50,000 bail. It’s unclear if any of the men have attorneys to speak for them. De Back said police also arrested two 17-year-old juveniles from Baton Rouge. While the three men and one juvenile are charged with assaulting both the guard and the officer, one juvenile is charged with only assaulting the officer. Dillard’s and the mall didn’t respond to requests for comment from local media. Management for Boosie did not respond to requests for comment from The Associated Press.